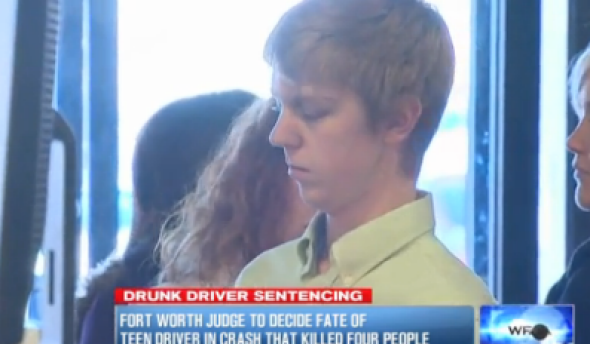 Affluenza teen Ethan Couch reportedly arrested in Mexico. “Affluenza” teen Ethan Couch reportedly captured in Mexico. CNN is reporting that Mexican authorities have detained “affluenza teen” Ethan Couch in the Mexican resort town of Puerto Vallarta more than a thousand miles from their Texas home. Couch has been on the run with his mother from authorities in Texas after a video surfaced of the 18-year-old at a party where alcohol was being consumed, in violation of his probation. The Texas teen’s court case made national headlines in Dec. 2013 when his lawyers argued—successfully—that the then-16-year-old shouldn’t serve time in jail for killing four people while driving drunk because his privilege, and parenting, was such that for Couch there was “no rational link between behavior and consequences.” His lawyers even coined the term “affluenza” to describe the reasoning behind Couch’s reckless, deadly behavior. The prosecutors asked for a 20-year prison term; the judge sentenced Couch to 10 years probation. [Couch] is wanted by authorities in Tarrant County, Texas, for allegedly violating probation. His mother was listed by Texas authorities as a missing person after her son’s disappearance, and the authorities said they believed she was assisting her son. A warrant had been issued for the teen to be taken into custody after his probation officer couldn’t reach him earlier this month… At the time of his conviction, prosecutors said Couch could be incarcerated up to 10 years for violating his probation terms. Couch is expected to be turned over to U.S. authorities.